Emphasizing sounds is something all Speech Language Pathologists will do. It is something that is essential early on in developing the consistency and accuracy of a sound. It is very important to manage emphasis effectively though. You need to be very aware of when you and your child are using emphasis. Emphasis also is an indicator that the target sound is not automatic yet. 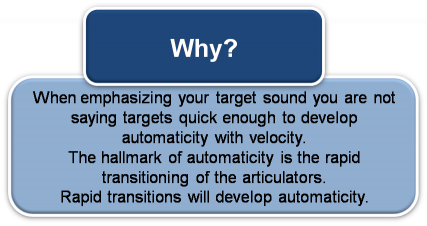 If emphasis is still occurring in word, sentence and conversation levels you will find developing automaticity will take much longer. To effectively manage emphasis, you need to focus on working on speed. Speed Drills will eliminate emphasis. Emphasis is like a brake. You can not go fast with it on. Once you are able to do your speech drills rapidly, you will be able to conquer emphasis. Awareness of emphasis is key. Emphasis should be gone by the time you are working on word level drills!